13 metre Manitou telehandler (teleporter), perfect for transporting all types of materials on building sites, comes with both forklift and bucket attachments and has a 3 tonne lifting capacity. 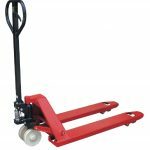 Full range of heavy duty manual pallet trucks for use in warehouses, factories and shops. Tough polyurathane wheels and 180 degrees manoeuvrability. 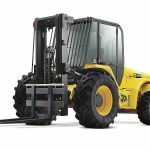 This Rough Terrain Forklift is a four-wheel drive straight masted truck. 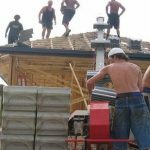 Designed for a host of site purposes, it will safely and efficiently place loads of up to 1200 kg at a maximum height of 5.5m. Whilst easily lift bricks, blocks and lintels, this handy tool saves hours on the site, and is easy to set up. A versatile general purpose skip which can be used for bottom discharge applications or by lowering the attached chute can be used as a side discharge skip. 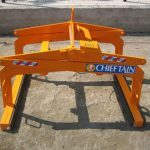 This item is ideal for moving strapped packs of blocks, slabs or kerbs.